A journalist has received a torrent of abuse after being mistaken for his namesake, disgraced Australian cricket captain Steve Smith, who admitted cheating during a match in South Africa over the weekend. Aussie cricketer Smith, 28, resigned as his country’s captain after admitting that ball tampering by batsman Cameron Bancroft during the test against South Africa – in which he illegally altered the ball’s condition to gain an advantage – had been orchestrated by himself. Opening batsman Bancroft was captured by cameras using sticky yellow tape, sugar granules, and an unnamed ‘sharp object’ to alter the surface of the ball, which could have given his side a valuable advantage. Bancroft was filmed shoving the sticky tape down the front of his pants. The ‘shame’ of the scandal has been labeled the “darkest day in Australian sport” by some journalists. Many have called for the whole of the Australian team’s ‘leadership circle’ to be fired. 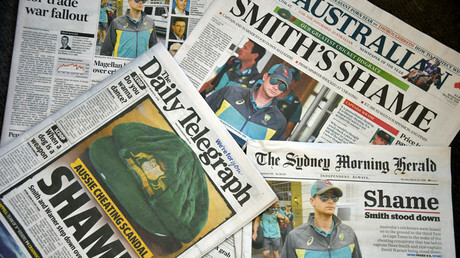 However, one Australian man with the same name, ESPN writer Steve Smith, seemed to bear the brunt of the criticism. Smith tweeted that he had woken up on Saturday morning, inundated with vitriol he had received after Twitter users confused his verified account with that of the cricket captain. The cricket captain Steve Smith received an immediate punishment of a one-test ban, 100 percent match-fee fine, as well as resigning as Australia captain after admitting he and the team’s ‘leadership circle’ knew about Bancroft’s tampering. On Monday, Smith also stepped down as captain of Indian Premier League team Rajasthan Royals. He and Vice-Captain David Warner are both facing life bans if the maximum penalty is applied under Cricket Australia’s code of behavior. Bancroft was fined 75 percent of his match fee, and handed three demerit points for breaching Level 2 of the ICC Code of Conduct.